To switch between network modes go to macOS menu bar when virtual machine is active > Devices menu > Network. 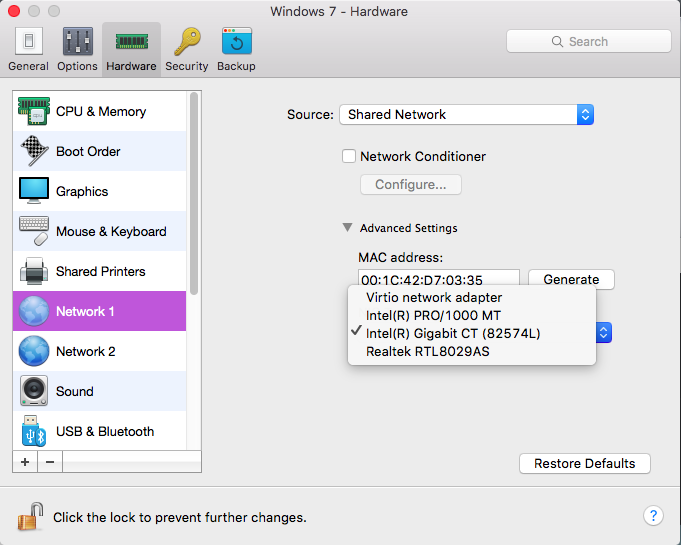 Note: configuring Shared and Host-Only networks is available in Pro Edition in Parallels Desktop Preferences > Network. 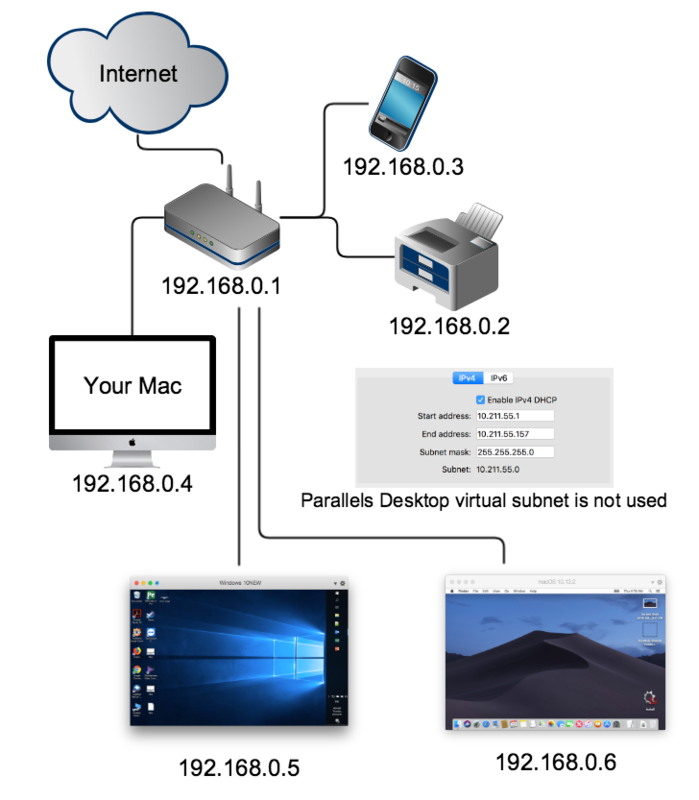 Parallels Desktop creates a separate virtual subnet with its own virtual DHCP server running in macOS. A virtual machine belongs to that virtual subnet with its own IP range. A virtual machine is not visible in the real subnet the Mac belongs to. A virtual machine use full Internet access. If Mac is connected to virtual private network - VPN access is automatically shared with virtual machine. This network mode is suitable for most of user needs. A virtual machine appears as a separate computer that belongs to the same subnet as the Mac it is running on. A DHCP server (e.g., your router) provides a virtual machine with an IP address within the same IP range as other computers in the same subnet. A virtual machine can ping and see all computers in the subnet. Other computers can ping and see the virtual machine. Note: when selecting this network mode Parallels Desktop is no longer responsible for network connectivity issues. Bridged network can be enabled on a particular network interface, such as Ethernet, Wi-Fi or other Mac network interfaces. 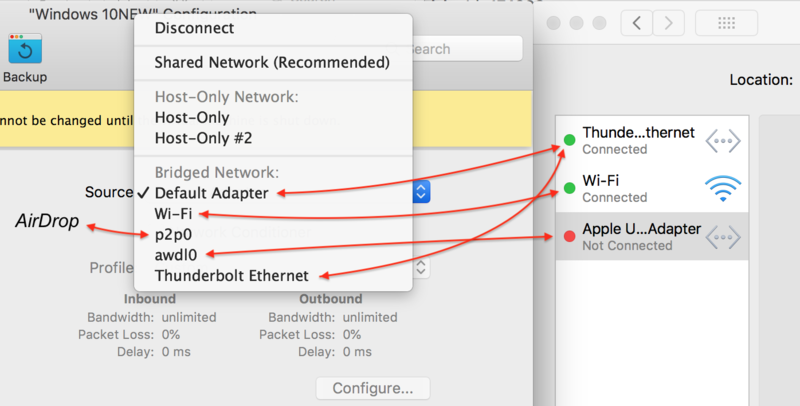 Bridged: Default Adapter corresponds to whichever network adapter is chosen as the default (the first in the list System Preferences > Network) on the Mac. This mode is similar to Shared Network except that this virtual subnet (10.37.129.x) is isolated from the outer world. As a result, the virtual machine that is working in host-only mode can only see and ping other virtual machines and communicate with the gateway (10.37.129.1). The networking technology basics below should help you decide which networking mode to choose. When talking about networking we often use terms like IP address, DHCP Server, subnetwork, and many others. The first three are the most important in our case. A numerical label assigned to each device (e.g., computer, printer) participating in a computer network that uses the Internet Protocol (IP) for communication. IP addresses are represented in dot-decimal notation, which consists of four decimal numbers, each ranging from 0 to 255, separated by dots, e.g., 192.168.0.10. Each part represents a group of eight bits of the address. IP addresses, like regular addresses, are used by computers and other devices to communicate with each other. An IP address can be assigned to a network device (e.g., computer, printer, tablet, smartphone, etc.) either manually by a user or a System Administrator, or automatically by a DHCP server. 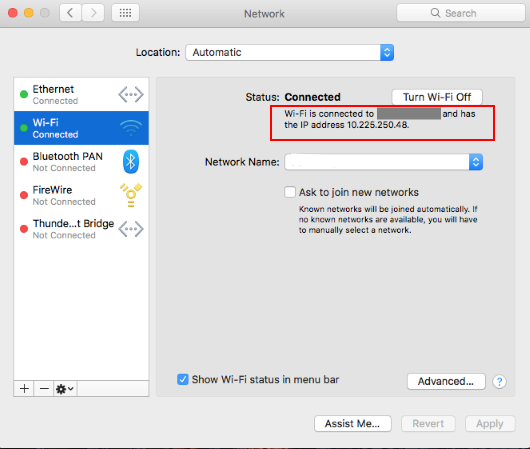 To see the IP address of your Mac, go to System Preferences > Network. A computer or a specific network device (router) that maintains a database of available IP addresses and configuration information. When the server receives a request from a client device (e.g., computer, printer), the DHCP server determines the network to which the DHCP client is connected, and then allocates an IP address that is appropriate for the client, and sends configuration information appropriate for that client. 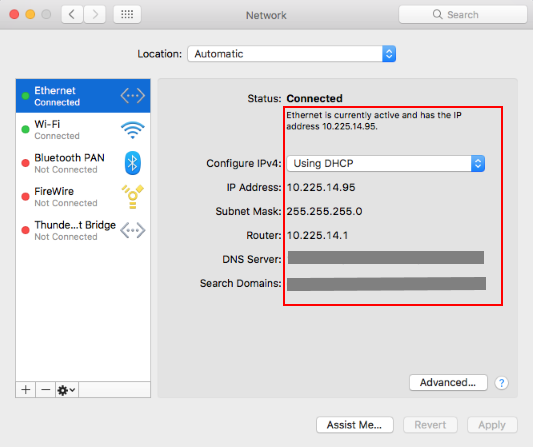 In an average home network your router will work as a DHCP server that automatically assigns the IP addresses to all your network devices so that you do not need to worry about the IP addresses and other necessary settings for your Mac or a smartphone. A logically visible subdivision of an IP network. The practice of dividing a network into two or more networks is called subnetting. All computers that belong to a subnet are addressed with a common, identical, most-significant bit-group in their IP address. For example, a typical home subnet will have IP addresses in the following range: 192.168.0.1-255. This means your Wi-Fi router will have an IP address of 192.168.0.1, your MacBook Pro® will have an IP address of 192.168.0.10, your smartphone - 192.168.0.20 and your wireless printer - 192.168.0.30. To learn more about the settings of the DHCP server, please read your router's documentation. Traffic between subnetworks is exchanged or routed with special gateways called routers, which constitute the logical or physical boundaries between the subnets. Virtio network adapter is the fastest card. However, it works only in Linux and BSD guest operating systems. It is a default adapter for Linux-based OSes. Intel® PRO/1000 MT is a default network adapter for Windows and Mac OS X virtual machines. It works in all operating systems. It also counts a checksum and splits packages. Thus it allows to increase the network performance. Intel® Gigabit CT (82574L) Support for this network interface was added in Parallels Desktop 11 for Mac. This is Intel's e1000e Ethernet driver. Realtek RTL8029AS is the simplest adapter from the list. It does not count a checksum or split packages. The Realtek adapter can be used only if you have Parallels Tools installed in your virtual machine. Without Parallels Tools it will work very slow or even will not work at all. It works especially good with Windows XP virtual machines.